Hassan, Selim. 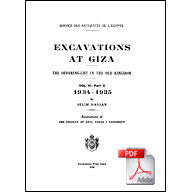 Excavations at Gîza 6: 1934-1935. Part 2 Text: The Offering List in the Old Kingdom. Cairo: Government Press, 1948.